Today, May 15 2011, is the day the Palestinians commemorate the 63th anniversary of Nakba, the catastrophe that stripped them of their land and made them refugees, slaves, and terrorist in the eyes of the world. It is the 63th anniversary of the declaration of an independent Israel. It is also the critical turning point for the rest of the world. You may not feel it. This morning, when you woke up, the sun may have been shining through your windows. Birds were singing. Everything felt quite ordinary, and your coffee tasted just as great as usually. But everything is going to change, and it's going to change right now. It's T minus X and counting. Well, it is the underreported story of the century, so far. It is complex and difficult to understand, but I know that anybody who reads this blog must be extraordinarly gifted and tenacious, so I will explain what's up. The US public debt has grown to a size, where it is about to hit the debt ceiling. For a month the US Congress has been locked in a stale-mate over a bill to raise the debt ceiling, a proposal widely considered a must-pass. "OECD calculations say that for every percentage point of Chinese growth 16 million people are helped out of poverty in the developing world." Nonetheless, the Republican opposition has called for severe austerity measures along the lines of recent IMF recommendations to curb a pending economic depression. They want the issue resolved before agreeing to raising the debt ceiling. "The U.S. has a lot of credibility. This does not imply their credibility can last forever," IMF fiscal affairs director Carlo Cottarelli said as he released the IMF study. It concluded that the United States is falling behind on a promise it made to other top economic countries to halve its budget deficit by 2013. That crisis is less acute than current crisis, which forms over the inability of Congress to reach a consensus regarding the bill to raise the debt ceiling. Hitting the debt ceiling has the approximate effect of US defaulting on its loans, an unprecedented event in history. The debt ceiling is about to be hit. The date given by US Treasury Secretary Timothy Geithner on April 4, 2011, is "no later than May 16", a date that should have put pressure on Congress to avoid a default. It is tomorrow, when Congress reconvenes to debate the debt ceiling measure in the 59th minute of the 11th hour. "...curbing this crisis is a question of whether it unfolds on a vast and rapid scale with unforeseeable consequences on economy and politics, as the two spheres collide and mingle, and whether it unfolds slowly and gradually." If the debt ceiling is not increased by May 16 the Treasury has authority to take extraordinary measures to temporarily postpone the date the United States would default on its obligations, but with a time limit of eight weeks and "no headroom" to borrow within the limit after July 8, 2011. The consequences of a US default are literally unfathomable. The crisis that will ripple through the financial markets is described as "1000 times worse" than the sup-prime mortgage crisis in 2008 and the following recession by ABC journalist, Jake Tapper. "Imagine the financial crisis we've just seen two years ago, 1000 times worse... It's a scenario we have never really bothered to look at... It would leave the financial system in a situation that is functionally unimaginable." Treasury Secretary Timothy Geithner says Republicans are assuring the administration that they will pass an increase in the government's borrowing limit in time to prevent an unprecedented default on the nation's debt. Geithner tells NBC's "Meet the Press" that Republicans gave this assurance to President Barack Obama at a White House meeting last Wednesday. Geithner says Republican leaders told Obama that they recognized that they couldn't play around with the government's credit rating and he's confident Congress will act in time. Instead we've witnessed how partisan bickering has led USA down a very dangerous road, which already in the preliminary stages may have severe effects on the economy. "...the ability to conduct economic warfare without triggering enmity, rests on a number of factors, namely equilibrium, equanimity and equity between the opponents." Republicans have tried to pressure the Democratic administation into giving concessions on budget cuts on US entitlements, healthcare and pension, and the partisan split has been so severe that there's been talk of a possible government shutdown. Government shutdown is not in itself as catastrophic as it may sound. It just means that all non-essential government functions are shut down, until Congress can reach an agreement. Shutdown may affect a lot of US citizens, but it doesn't necessarily send the world spinning into economic crisis. a default by the U.S. Treasury, or even an extended delay in raising the debt ceiling, could lead to a downgrade of the U.S. sovereign credit rating. That's the minor part of the problem, really. It is a problem in itself, but it is nothing in comparison to the dumping of US Treasury Bonds. Foreign investors, namely China, Japan and South Korea, hold nearly half of the outstanding US Treasury debt. The Washington budget is dependent on its credit rating, which defines its ability to take up loans, and on the willingness of foreign investors to hold what could quickly become toxic assets. "...foreign investors (...) could reduce their purchases of Treasuries on a permanent basis, and potentially even sell some of their existing holdings. Those are the words of Matthew E. Zames, a managing director at JPMorgan Chase and the chairman of the Treasury Borrowing Advisory Committee, which meets quarterly with the Treasury Department. The projected dumping of purchases of Treasuries is far from as theoretical as it is put in the diplomatic letter to Secretary of the Department of Treasury, Timothy Geithner, on April 25, 2011. It is what will most definitely occur, if US defaults. "It is exactly similar to the sub-prime mortgage crisis, except on a much wider scale, encompassing the entire American household, the federal government." As a consequence the run on money market funds would trigger "a severe crisis, disrupting markets and ultimately necessitating the same kind of backstops that Treasury and the Federal Reserve initiated in the aftermath of the 2008 crisis", as it is put by Matthew E. Zames in his step-by-step breakdown of the crisis scenario unfolding. I say unfolding, because curbing this crisis is a question of whether it unfolds on a vast and rapid scale with unforeseeable consequences on economy and politics, as the two spheres collide and mingle, and whether it unfolds slowly and gradually. Whatever the case may be the decline of the US economy is pretty much a fait accompli. Another bail-out measure would increase the negative rating from investors, downgrade the dollar as reserve currency, and initiate a mass transition to an alternative reserve currency - which has already taken place locally between Russia and China in November 2010, where they began using their domestic currencies for bilateral trade. US Treasuries have historically been viewed as the world's safest asset. They are the most widely-used collateral in the world and underpin large parts of the financing markets. Companies would be driven to deleveraging, and many would default. It's the same scenario as 2008, except on a wider scale and with more irreperable damage to the US economy. So, common sense would be to raise the debt ceiling, and forego further stalling from mixing it in with the austerity measures, but even that doesn't remove the problem. It just pushes it two years ahead in time. U.S. federal budget deficit reached 1.29 trillion dollars in the fiscal year 2010, and according to President Obama's fiscal year 2012 budget, the federal deficit in 2011 is expected to hit a new record of 1.65 trillion dollars. "Whatever the case may be the decline of the US economy is pretty much a fait accompli." Compare it to a private household: You effectively borrow money to pay off debt. That's called a debt carousel. At some point creditors are going to grow wise to it and stop lending you. At that point your collective debt with interest rates begin to choke you. It's not entirely the same: The US treasuries are guarantees for loans that are not expected to be paid back, but expected to be tradeable. China is already concerned, because if US treasuries drop they have invested over a trillion dollars that may be only half of that on the market. It is exactly similar to the sub-prime mortgage crisis, except on a much wider scale, encompassing the entire American household, the federal government. In April 2011 a new report from the US Treasury showed that Mainland China has decreased its holdings of U.S. Treasury securities since October 2010, when China passed Germany as the largest exporter of goods in the world. Since September 2008, when China eclipsed Japan as the 2nd largest economy in the world, China has also been the largest foreign holder of US treasuries, but repeatedly cut back in investments in treasures over the last months. In October 2010, China owned 1.1753 trillion in U.S. Treasury securities, dropping to $1.1641 trillion by the end of November and $1.1601 trillion by the end of December. By the end of February this year the Chinese holdings were $1.1547 trillion, accounting for 26 percent of total foreign holdings of Treasure securities. The gradual reduction reflects China's push to diversify its foreign investment portfolio to curb the impact of a declining US credit rating on its own economy, but substantial cutbacks could also trigger the very same scenario from the outside that Washington is trying to alleviate form inside of USA. That has been a major concern for analysts and advisors in the intersection of national strategy and economics, who consider the strategic dumping of US Treasury bonds an economic weapon and a serious risk to the US economy. "The more investments they have within each other's countries, the higher the cost of taking it to war. The more rational the conduct of an administration is, the better the chance that actual disagreements are resolved." The issue has been brought up several times, when conflicting American and Chinese interests have been aired in public - the risk that China would use its economic leverage to inflict serious damage on the US economy. The scenario is generally considered "mutually assured destruction" or "mutually assured distress", since Chinese economy is dependent on the US market for exports. A slowing US economy means a major blow to the Chinese manufacturers, who export about 20 percent of their goods to USA, and also a general effect on the world economy, including Japan and Korea that are noted for about the same percentage of the Chinese export combined. So far the Chinese response to the situation, including the sub-prime mortgage crisis in 2008, has been one of ultimate responsibility and cooperation. Flash points for potential conflicts, however, are numerous. We can roughly count seven areas, where American and Chinese interests may collide, causing a rift that leads to war, either a slow-burning economic warfare, or actual armed conflict. First of all, to understand the dynamics of economic war, one must realize that economic warfare is quite legitimate and leisurely applied in many bilateral relations, even friendly ones. Economic warfare is, as such, not necessarily indicative of a zero-sum game, and not necessarily illegitimate - it depends on the framework of trade agreements. All players apply trade tariffs, subsidies and other measures to improve their ability to compete on the market, or to curb other player's advances, or cut their advantages. It is, however, also important to understand that economic warfare can be seen as hostile, and trigger intensified hostile measures in turn, including military aggression. Such military aggression doesn't have to be direct, as in an open Sino-American military conflict. "The Chinese savings are actually hoarded and used to prop up Washington's bloated budget." It is more likely to evolve as a slow-burning strategy game involving key strategic and economic interest areas, where players may compete without actually engaging in a mutually devastating war. Also, the ability to conduct economic warfare without triggering enmity, rests on a number of factors, namely equilibrium, equanimity and equity between the opponents. The more investments they have within each other's countries, the higher the cost of taking it to war. The more rational the conduct of an administration is, the better the chance that actual disagreements are resolved. In the case of USA and China accords have consistently been reached and kept over the past 27 years with a couple of major blow-outs, namely Den Xiaopeng's outrageous massacre on Tianmen Square in 1989 and the CIA bombing of the Chinese embassy in Belgrade in 1999, where three Chinese were killed. Chances of open conflict are, as long as the economic interests are as entwined as they are, small. Irrational factors, however, can throw off the most carefully established equilibriums and destroy both equanimity and equity in the process. It's important to understand that there are political players who would use the above mentioned flash points to trigger discord for selfish and short-term political gains. It will be too extensive in this article to go into detail about the list of potential flash-points in the Sino-American relationship, but I will get back on the subject in an independent article. So far, it suffices to say that the current equilibrium between USA and China rests on economic partnership, and may collapse with the triggering of either of the geopolitical conflicts in which the superpowers have a vested interest. "90 percent of the population believes the income gap is "serious", and 80 percent wants the Chinese government to take action." The road map for integration of American and Chinese interests contains some American demands for liberalization, and a certain level of liberalization automatically occurs with open markets and the rapid distribution of information technologies, censorship or not. The breaking point for the Chinese economy lies in savings and capital hoarding. In 2008 China was virtually the only the country in the world that wasn't cash strapped. The reason is that Chinese households, as well as the Chinese government, refrain from lending. In China households save on average 25-50 percent of their income. Less than 1 percent of urban Chinese take consumer loans, while 47 percent of all US families have instalment. The American average household income is about eight times that of the urban Chinese family and much even higher when compared to the rural Chinese population, and yet the Chinese savings are actually hoarded and used to prop up Washington's bloated budget. Even one small factor as the fact that a significant portion of the 213 super-rich Chinese according to Forbes have begun moving their money out of the country will, in short time, lead to depletion of the Chinese capital funds. That means no more money to lend to USA to stabilize its economy and the export market. Paradoxically, the gradual freedom pushed by Washington in dialogues with China will set off the mechanism that dumps the US dollar on the ground. That is actually the most probably perspective: Income discrepancies in China are extreme, particularly between rural Chinese and urban Chinese, where the urban population owns 3.2 times more. In China 10 percent of the population owns 40 percent of the wealth, while the lower 10 percent owns only 2 percent of the countries wealth. According to a recent poll 90 percent of the population believes the income gap is "serious", and 80 percent wants the Chinese government to take action. On top of the now constant concern for new Wall Street bubbles emerging from the West, analysts warn of the potential for Chinese economy overheating and creating dangerous over-investment frenzies. "...the "news" of Chinese neo-Confucianism has been peddled in the West at least since 1961." China is a developing nation and will remain so for decades to come. Hu Jintao has made a point of stressing that "China will always be a developing nation", which is Chinese for saying that as far as you can look into the horizon, Beijing will remain committed to its partners - just like USA is committed to hers. Domestically, the developing nation status means that China's main project in securing stable growth is to cultivate a strong middle class. So far post-Communist China has played the developing game with unparallelled equanimity, and as long as Hu Jintao is at the helm we can expect Beijing to remain a profoundly rational player. That means they will do what countries do to secure peace, stability and economic growth, following utilitaristic logic and applying Keynesian measures to also satiate ever wider parts of its population. This priority will grow over time, gradually removing Chinese interest in placing its capital in USA as its own purchase power parity grows. China is already the largest consumer market in several fields, and it has succesfully conducted a grand multilateral effort to expand its trade relations to Africa, Latin America, East Asia and South East Asia, and its business now involves nuclear facilities in Pakistan, strategic and economic cooperation with Iran, and preliminary investments in Afghanistan. OECD calculations say that for every percentage point of Chinese growth 16 million people are helped out of poverty in the developing world. Will the US Response Be Rational? Even if China shouldn't dump their holdings of US Treasures, the decline of USA is as much of a certainty as anything relating to the future can ever be. China, along with the rest of BRIC, will put USA and Europe in the shadows. Washington is faced with the prospect of becoming a military power insufficient productivity to sustain it, which will likely send USA the way of Soviet Russia. The choice for Washington is pretty much between a rapid decline or a slow and steady decline. In such a scenario the question to many would be if Washington and Pentagon would keep their head about them, if a policy of equilibrium and equanimity and equity will be sustained, or if USA will instigate conflict to use its military power to regain its former supremacy by force. Mutually Assured Destruction applies to a revitalization of the Cold War dynamics. Even if China is the smallest of the major nuclear powers, the Sino-Russian alliance formalized in the Shanghai Cooperation Organization (SCO) actually puts USA at a disadvantage in a nuclear confrontation, if it makes sense to talk about advantage and disadvantage in a scenario involving thousands of armed nuclear warheads in the air. "In this day and age all conflict is communication, and there is no aspect of warfare that cannot be encompassed by linguistics." The logic that prevents the US industrial base from making a huge comeback is the same that facilitated the Chinese ascension: Wage levels and working conditions for its hordes of factory workers are, as we all know, appalling in China. The wage expense for the industrialists in America whose initial boom was based on slavery labor has become the most daunting obstacle to competitiveness on the global production market. In the globalized information age high impact economic weapons such as OPECs oil weapon and Iran's Hormuz Strait Crisis Scenario (blocking 20 percent of world oil supplies) and China's dollar weapon described in this article are, at least on some levels, more effective as deterrents and as actual measures. The Hormuz Strait Crisis is probably the actual reason why Iran hasn't been invaded yet, just as OPEC's power is the main reason for USA's many illicit operation's in the Middle East throughout the past 60 years. Economic weapons of mass destruction are not always an advantage as deterrents, because rational players will recognize it, but populist politicians and the public have a notoriously hard time comprehending economic measures. The problem with economic weapons is their relative anonymity. Another problem is if you mostly rely on high impact economic weapons with few less severe alteratives. The public anonymity of economic deterrents also provides nefarious players, such as secret intelligence agencies, the option to use instigation of conflict in potential geopolitical hot spots to trigger the premature or ineffectual use of a strategic economic measure. "Predictability is the key parameter for foreign investors in any nation. You don't have to read the Economist to realize that." For instance, at the moment, the US national treasury investments are more important to China as a deterrent than as a weapon, even if there was considerable loss in a simple economic analysis: USA is still more powerful on conventional warfare and capable of inflicting considerable damage. In some cases an irrational player, driven towards conflict by an ideological or religious motive, can heat up one or more flash-points. In other cases there may be short term commercial or even professional interests at stake, even to the point of vanity or tenure in individuals, as we witnessed in the eight years of neo-conservative administration of USA. Irrational geopolitical conflicts may even be pushed by partisan politics, an urge or a need to corrupt accomplishments of a political oppenent. In either case, hitting one of the seven buttons mentioned above, might be used by extremists to produce an artificial Sino-American conflict. The buzz-word of this era is "soft power", derived from the way the world perceive's China's gentleman-style appearance on the world scene, an event that has been dubbed the most significant in the century, even before the century has really taken off. In order to maximize the effect of economic weapons all players need to learn to analyze their leverage into middle-tones. You may call it an exercise in learning to threaten, to warn and to correct, without provoking an irrational reponse. In this day and age all conflict is communication, and there is no aspect of warfare that cannot be encompassed by linguistics. Beijing currently displays masteful prowess, always firm, always polite, and with the ability to manipulate situations to her own advantage without completely alienating partners. The problem at this juncture is Washington. Some parts of the US political establisment are likely to perceive China as an enemy, and her recent reserve towards the US treasury bonds, or an increased detachment from investment as further proof of malicious intent. They are likely to feel threatened by Beijing, who has begun to display and use the geopolitical power on major global topics like ecology and economy. These traditionalists are likely to oppose any sign that Beijing would use its leverage to coerce Washington. Oppositely, Washington doesn't seem to have any problem coercing anybody by any means, appearing often crude and with very few grades or nuances in its appraches: She moves from benevolence to high-impact violence in very short time. "That was the extent of the crisis, the black hole bankers and politicans in America were staring into: Social disruption, civil conflict, possibly ending with either a dictatorial regime or a socialist revolution." Military power remains the apex of the American identity: Recently released budget proposals by both Democrats and Republicans show that base levels for Pentagon funding continue to rise. 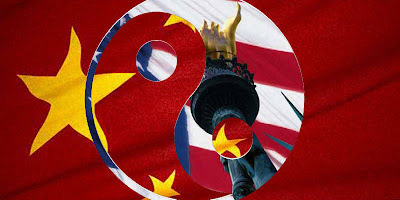 Washington's lack of equanimity is the most crucial factor in a possible strategic dumping scenario involving Beijing. As a bipolar democracy USA is erratic by definition, swinging wildly between two extremes, but the one point of a convergence is dedication to a "muscular foreign policy." Washington likes to portray Beijing as polarized, with lots and lots of people starving for freedom, and China about to keel over like in the Arab world. Reversely, Beijing perceives the USA as weak from inner division, politically polarized in a way that could signal serious instability. Predictability is the key parameter for foreign investors in any nation. You don't have to read the Economist to realize that. In 2006 George Bush actually nullified Posse Commitatus, making it possible for the US military to serve as regulators in civil conflicts inside the nation. In 2008 thousands of soldiers were deployed in the streets of USA, and Congress was warned that if they didn't pass the bailout bill, the country could be facing Martial Law. A military report by the U.S. Army War College talks about the possibility of Pentagon resources and troops being used should the economic crisis lead to civil unrest, such as protests against businesses and government or runs on beleaguered banks. "The racism against Asians is quite generic and nearly absolute, since Asian representation is almost non-existent. It is the requirement, according to Ren- Girard, for a perfectly subconscious scapegoating process to take place." That was the extent of the crisis, the black hole bankers and politicans in America were staring into: Social disruption, civil conflict, possibly ending with either a dictatorial regime or a socialist revolution. Whatever they say about Barack Obama's commitment to the health care reform, the Democratic bail-out plan that caused the last rift in Congress rescued the financial insitutions and saved USA from socialism. How many people actually got that three years ago? China certainly did. It's fair to say that China, Japan and Korea through their foreign holdings in the US debt economy have loyally sustained USA and are the upholders of the global economy. When does such a loyalty end, so that the upholder becomes the destroyer? It takes a little more than national news about a regional conflict here or there. But there is such a scenario, in which Washington acts increasingly erratically, and by a combination of meddling with Chinese interests and spewing out belligerent rhetoric, actually makes it the path of least resistance and the most profitable option for China to dump the US economy. This mechanic is already at play, and it has been for a while. China is forced to gradually weaken the US economy, because chances are that forces in Washington - seeing that decline is inevitable - will respond by trying to take control of the Chinese dollar weapon and use it against Beijing. "At what point does the Asian respect, and acknowledgement of the intellectual and scientific contributions to world culture, and its loyalty to former colonialist powers, turn to a necessary strategy of self-protection?" How? By staging a situation like the current crisis in Congress, emphasizing the key points of the American distress and how it is related to the Chinese foreign holdings and credit rating. Then, provoking Beijing into applying the measure in its full strength, China will effectually be blamed for disrupting the entire world economy, and USA can swoop in with her military force, once more the action hero countries have to rely on. To avoid this framing Beijing has no option but to slowly and gently maim Washington in her own version of "a war of a thousand cuts", slowly using its influence to degrade the economic engine behind the vast US military apparatus. All the elements in the frame job against Beijing are already laid out: The racism against Asians is quite generic and nearly absolute, since Asian representation is almost non-existent. It is the requirement, according to Rene' Girard , for a perfectly subconscious scapegoating process to take place. China is already labelled Communist, when that is convenient, Capitalist when it is expedient enough, and Confucian when Westerners or system critics in exile want to prove some sort of inner division or fracture line in Chinese society - t he "news" of Chinese neo-Confucianism has been peddled in the West at least since 1961. The projection of multiple identites is convenient, and testifies to how Asia can all of a sudden change characteristics before the eyes of the West, according to what the Western narrative of itself as the heroic protagonist requires. Beijing is well aware of this, and the formation of a new East Asian identity may prove to be the most viable strategy for China and the formidable Asian economies, or at least a last resort in spite of serious cultural tensions and historical problems between the various Asian nations. With so much at stake, and considerable historical resentment between the East and the West, and the ever shifting mindscapes of geostrategic interests, what will happen when China actually outdoes USA, and becomes the best performing economy in the world - in 2016, in 2020, or in 2025, depending on who are doing the calculations? It's very up to America. Beijing can't change its mode. It's just simply growing. It's locked in singularity. So far the Asian economies have loyally backed up the US dollar, until the US conduct - its irresponsible warfare - drained its funds, leaving it helplessly indebted. At what point does the Asian respect, and acknowledgement of the intellectual and scientific contributions to world culture, and its loyalty to former colonialist powers, turn to a necessary strategy of self-protection? "Economic weapons of mass destruction are not always an advantage as deterrents, because rational players will recognize it, but populist politicians and the public have a notoriously hard time comprehending economic measures." Huntington has already named "Confucian China" one of the major enemies in a future Clash of Civilizations, and there has been much speculation about America's next "necessary enemy" - and most fingers point at China. That's logical. If that's the direction things will move in, China will have no choice but to do the unthinkable and cut her losses, dumping the US national treasury market and effectively sinking USA into a black hole of perpetual stagflation and global irrelevance, as the country is torn up from the inside in cultural and ethnic and partisan conflicts, necessitating the use of military clamp-down. Under such conditions it's absurd to think that USA would be in a condition to retaliate with military means. So, the American Empire ends today. USA can still be a rational player with a lot of influence, and will remain a superpower for quite a while. She can choose to become a rogue, or to embrace the new order of things with a constructive and cooperative attitude, or she can attempt to wrestle with the angel of fate until early dawn with the risks it entails. That is the depth of the concerns that rages through the US Congress these days: Whether to accept to inevitably become number 2, or to risk becoming a Third World Nation through a series of unpredictable political motions. The date is historical, because from this point on the unrivalled and excessive military hegemony attempted by USA through her Grand Area strategy, the logical and technological extention of Manifest Destiny, has come to an end. The rest is the just the unravelling, and a mere formality in the annals of history.